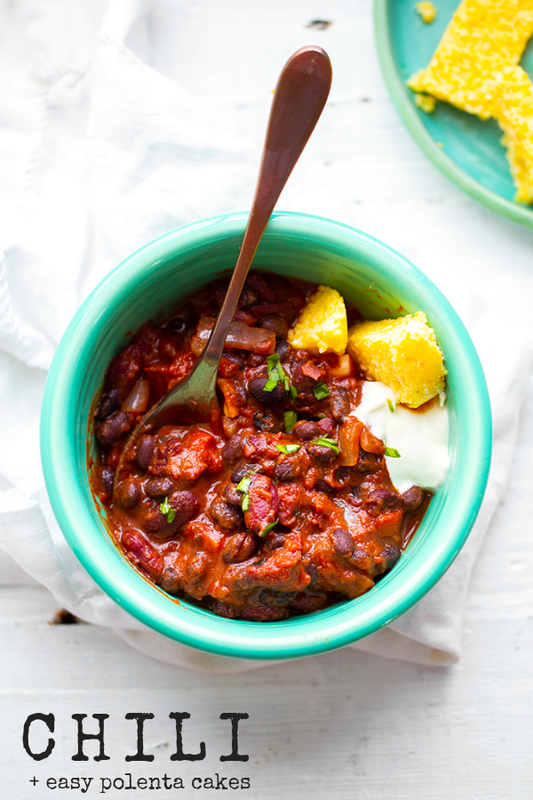 Vegan Chili is one of my most favorite meals. 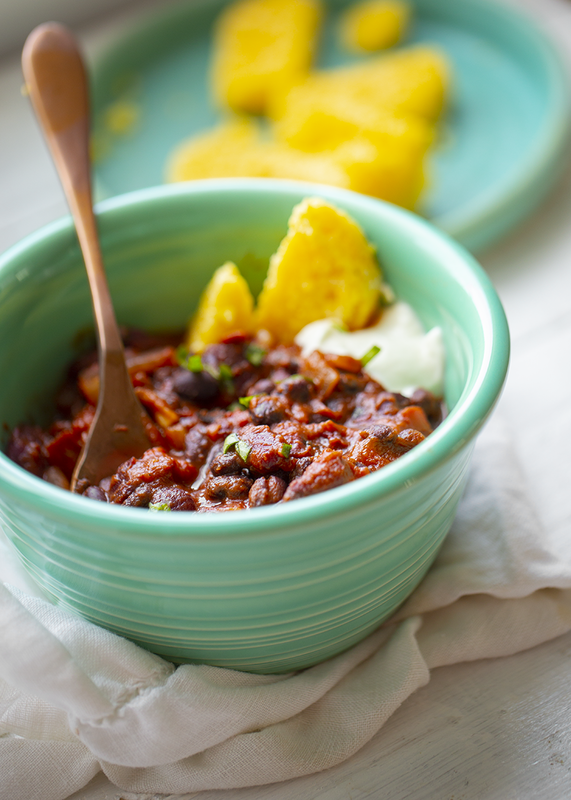 And the best part about chili is that it is so fast and easy to whip up! I made this batch is just around fifteen minutes yesterday. Really! 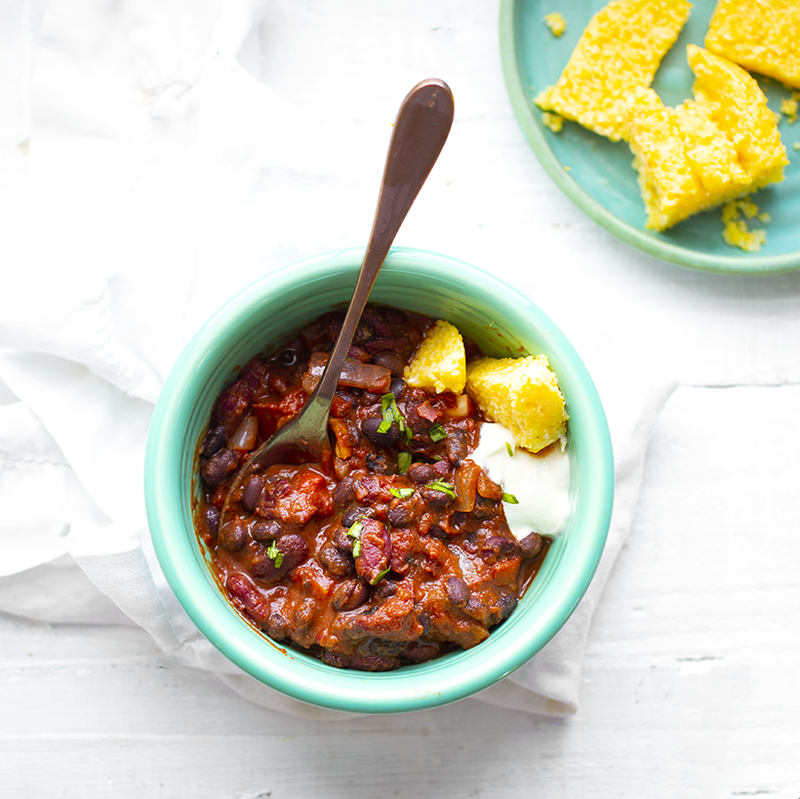 You can serve this deliciousness with optional easy polenta cakes. Both recipes ahead!.. Dinner in fifteen minutes is possible when you have your ingredients on hand and recipe planned out. 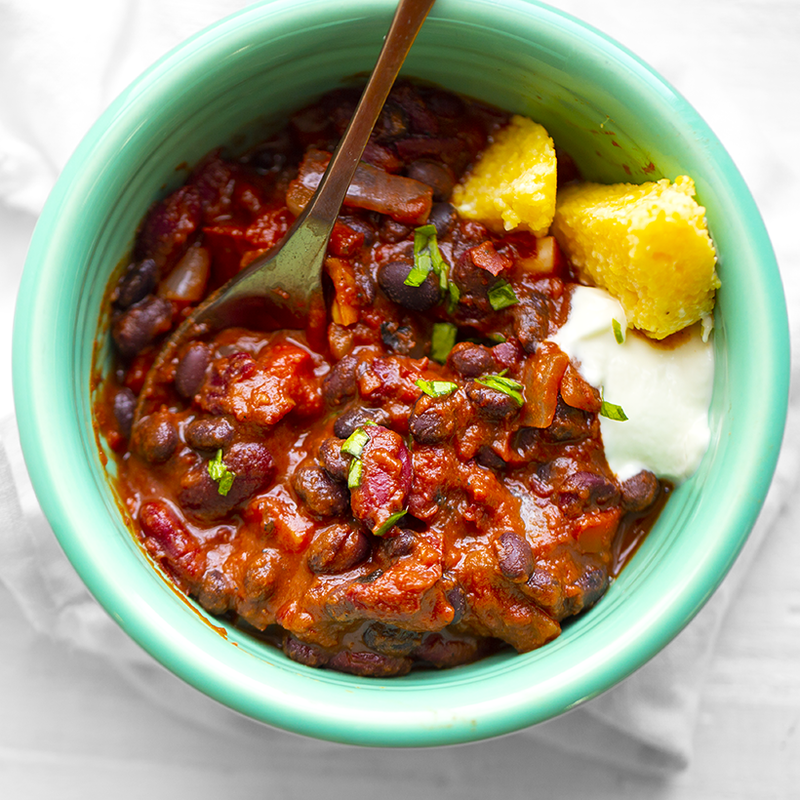 This is a very basic chili recipe that is very bold and delicious when it comes to flavor. And bonus, since it is rich in beans, spices and veggies, it is packed with fiber, a good source of iron and protein - among others. 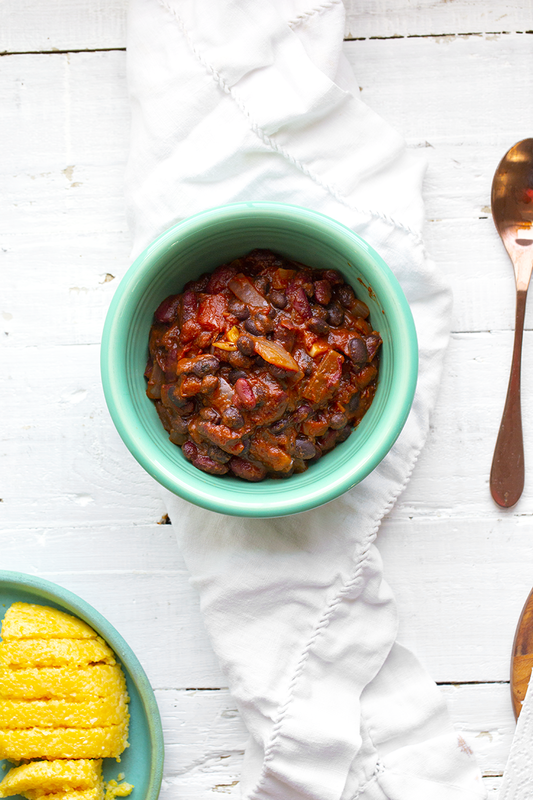 This chili is cozy, comforting and satisfying. The speed comes from the lack of veggies that need a long time to cook. The onions quickly soften in some oil - as does the garlic. And the beans are already cooked so things whip together quite swiftly! And a few cubes of polenta cake or corn bread on the side is the perfect starchy side. Beans. 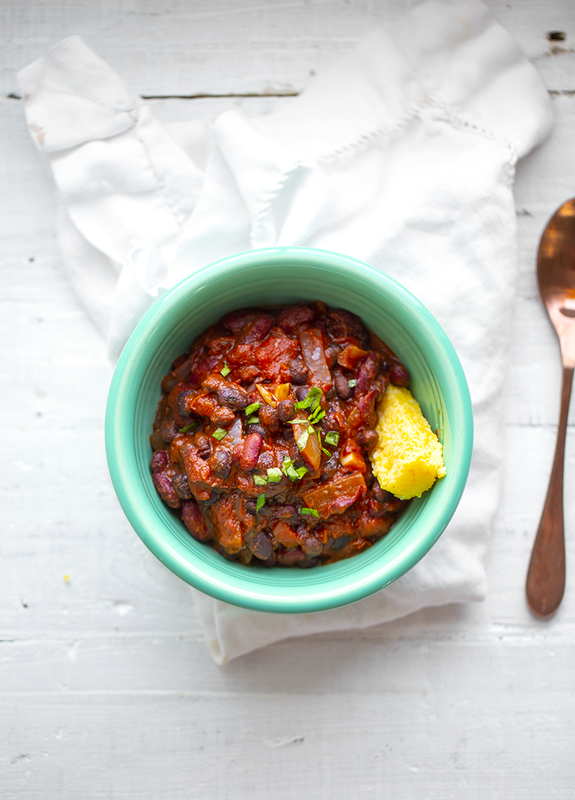 I like kidney beans best for chili. But for this version I did hald kidney, half black beans and it worked really well. Use what you have! Chickpeas and even white beans are other options. Heat. Start off with 1/4 tsp chili powder and add more to taste. Other ways to add heat: jalapeños, cayenne or even hot sauce over top to serve. I added in a few other ingredients that are optional like garlic, a bay leaf, brown sugar and cacao powder. - 5 minutes: chop the onion and garlic. Open cans. Rinse beans. Warm oil in pan. - 2 minutes: saute garlic and onion. - 5 minutes: close lid and allow to simmer. - 2 minutes: remove lid to cook down a bit + taste test. And of course for a more developed and marinated flavor you can also choose to keep simmering on low for 20-30 minutes. Or even make this ahead of time and serve the next day. But really, I tasted this in my 15-minutes cooking sesh and it was delicious! Add the water and salt to a small pot. Bring to a boil. Add the grits. Reduce heat to medium. Stir continuously for about five minutes. Keep stirring until the mixture is thickened and the grits are soft and cooked through. Continue stirring on and off for another ten minutes. Then transfer the grits to a well-oiled bowl. Cover and set aside for ten minutes. Flip bowl and slice and serve. 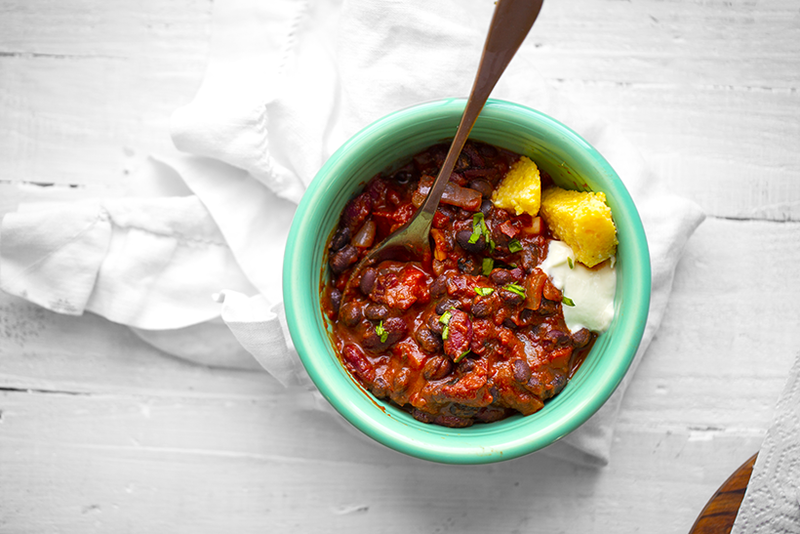 This thick and cozy, warming and satisfying bowl of vegan chili is packed with beans, tomatoes and spice. Prep: Chop onion and open your cans/boxes. Drain and rinse beans. Warm a large soup pot over high heat. Add the olive oil. When oil is warm, add in the onion and garlic. Stir and saute for 1-2 minutes to soften and brown the edges. Add in the beans, tomato paste, diced tomatoes, broth, chili powder, optional bay leaf, optional sugar, optional cacao and a starting pinch of salt and pepper. Stir well. As mixture begins to bubble, reduce heat to low-medium and cover with a lid. 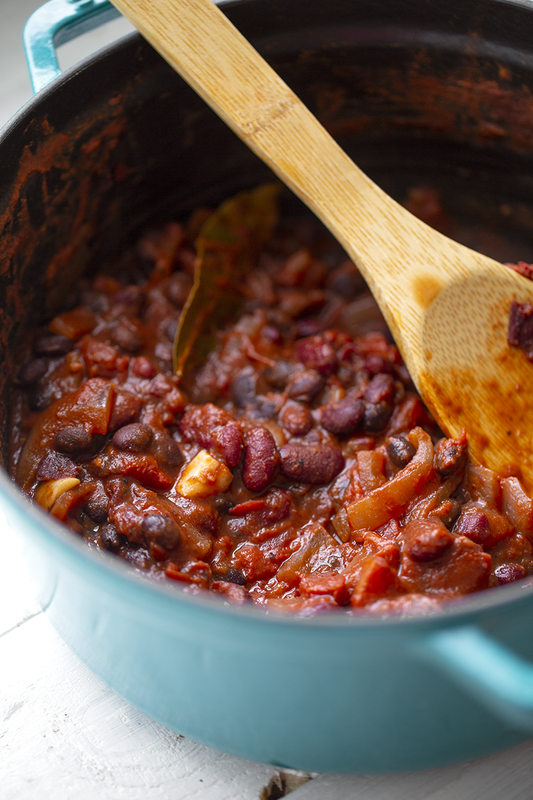 Allow the chili to simmer, covered, for about 4-5 minutes. Remove lid and stir. Taste. Adjust salt and chili powder if needed. Simmer for another few minutes to cook down to desired consistency/thickness. When texture and flavor is optimal, turn off heat and serve! Add optional vegan sour cream or mayo over top. 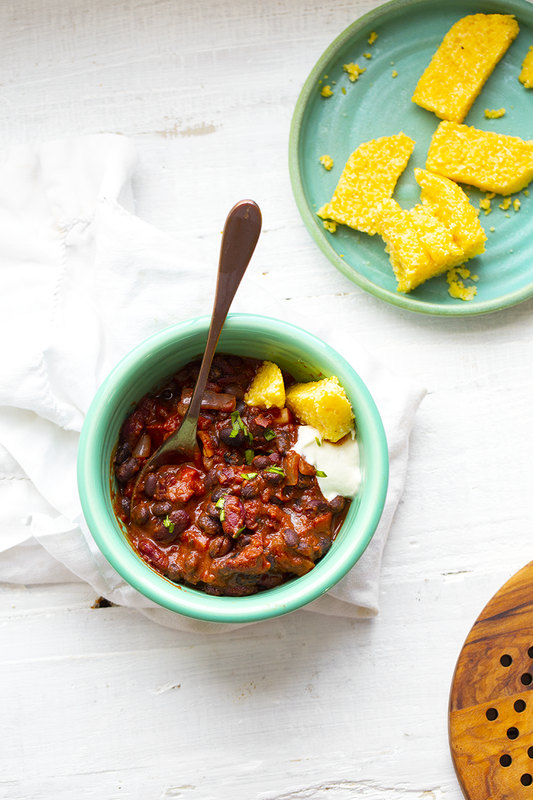 Corn bread or polenta cakes on the side are a nice starchy touch. You can see the bowl-shaped polenta here..